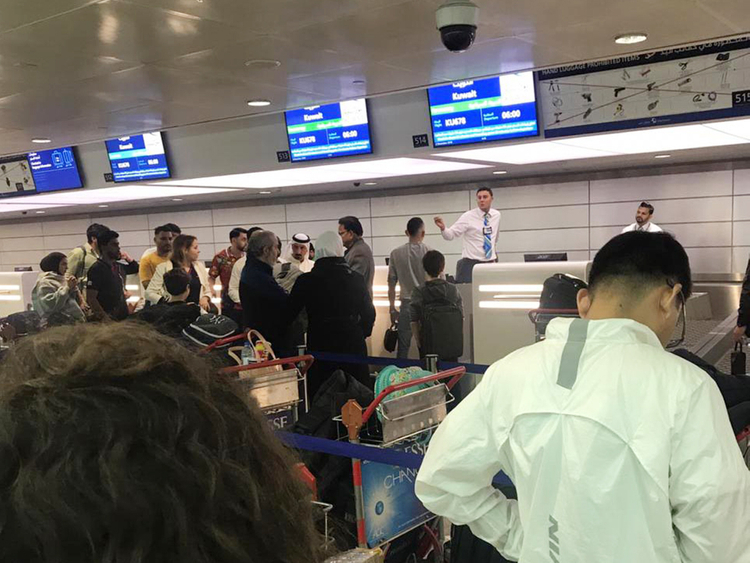 Dubai: Scores of Kuwait Airways passengers were left stranded, with several missing their connecting flights while others missing their appointments and business meetings as the airline cancels flights from Dubai due to poor weather conditions in Kuwait City. Most of the Kuwait Airways flights departing Dubai International Airport fly via Kuwait International Airport, with many passengers taking connecting flights from Kuwait onward to their final destinations. Passengers claimed that they had no prior information about any delay or cancellation of the flights and that the airline officials at the airport wouldn’t give them clear information about the rescheduling of the flights. “I was scheduled to fly to Cairo via Kuwait by Kuwait Airways flight KU 678 and then KU 541 and my departure was supposed to be at 6am on December 2. When I arrived at 3.30am the check in was open but after a few minutes it was closed abruptly without any information. Only after we ran around we got to know what was going on,” said Viren Narkar, a Dubai based Indian businessman who was on his way to Cairo to attend an exhibition which begins on Monday. The 68 year old said he was transferred to a hotel in Deira along with hundreds of others after waiting for more than seven hours at the airport. Another passenger on his way to Cairo said that the delay has forced him to miss his son’s surgery, which was scheduled to happen on Monday at the Egyptian capital. “I was flying to Cairo for my son’s operation, but now with this delay I am not sure if will reach in time. We are clueless what is happening. We have been told the delay is due to foggy conditions in Kuwait, but they could have handled this better,” said Omar Abdul Rahman, a Sudanese expatriate based in Sharjah. Passengers claim that some of flights that were scheduled to depart as early as 10pm on Saturday were also cancelled. Dauren Kairzhanov, a 28 year old expatriate from Kazakhastan was on his way to Doha, via Kuwait. He was supposed to fly out by KU 678 and then KU 617 to Doha in the early hours of Sunday, but even after waiting for the entire day he had no idea when he is going to board the flight. In a statement on its official Twitter account on Sunday, Kuwait Airways said it apologises to passengers “for the inconvenience caused by delayed flights for reasons beyond our control due to the closure of take off and landing” at the airport. The airline said it is working on providing the necessary care to its passengers and is transporting them to nearby hotels as well as offering them meals. On Saturday, Kuwait’s General Directorate of Civil Aviation said on its official Twitter account that some flights to Kuwait International are being rescheduled or delayed due to dense fog. The Directorate said that air traffic at the airport was suspended for seven hours between 1am and 8am. The disruption comes as Kuwait City continues to face adverse weather conditions. In mid-November, Kuwait International Airport temporarily suspended operations due to unstable weather conditions in the country, redirecting some flights to Dubai, Dammam, and Bahrain.